The Global Climate Action Summit, organized by California Gov. Jerry Brown, included a report that 27 major cities around the world have seen emissions decrease over a five-year period and are now at least 10 percent lower than their peak. The star-studded conference included a rousing call to action by Harrison Ford, who implored the audience to protect forests, fisheries and other natural wonders. Former President Barack Obama, under whose watch the U.S. agreed to the landmark Paris climate accord, made a brief appearance by video. The goal of the conference is to showcase actions already being taken to prevent climate change and to “inspire deeper commitments” among attendees. It was unclear what specific actions might be taken before the summit ends Friday. “Doing nothing is not an option. Going green is a must. Cities all over the world are on the front lines of climate change,” said Frank Jensen, lord mayor of Copenhagen, adding that the bicycle-friendly city wants even more bike lanes. Milan and Copenhagen are among the 27 major cities cited by C40 Cities Climate Leadership, a group whose board is headed by philanthropist and former New York City mayor Michael Bloomberg. In a speech, Bloomberg called the conference a way to broadcast that the U.S. is still committed to the cause. Bloomberg and Brown said they calculate the U.S. is within striking distance of the reduction in greenhouse gases it previously promised. Trump announced last year that he was withdrawing from the l climate accord. His administration is also pursuing policies that would boost methane emissions and roll back California’s strict vehicle emissions standards. In response to a question Thursday at a news briefing, Brown, Democrat, said Trump will likely be remembered poorly when it comes to the environment. “I think he’ll be remembered, on the path he’s now? I don’t know. Liar, criminal, fool,” the governor said. The CEO of Salesforce, one of the world’s largest online business software companies, urged fellow technology leaders at the conference to help fight climate change. CEO Marc Benioff announced that Salesforce and 20 technology companies have signed a pact to “decarbonize” by reducing greenhouse gas emissions worldwide through supply chains, regulations and customer efforts. 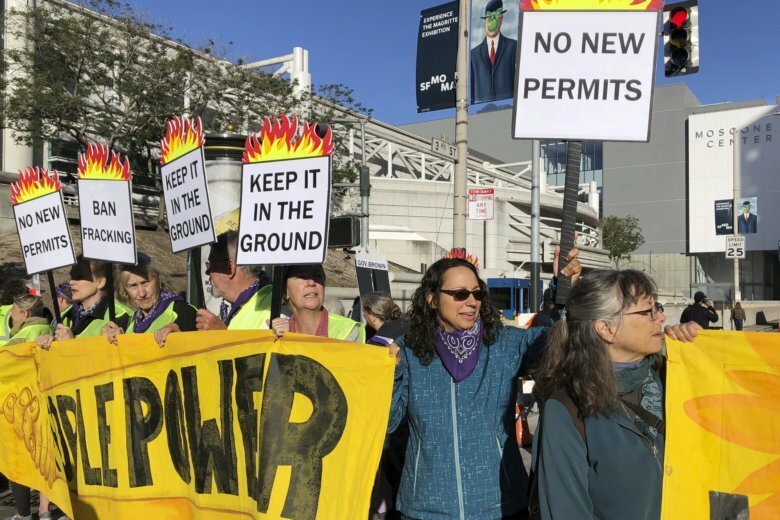 Protesters also called on Brown to ban the practice known as fracking, which injects high-pressure liquid into the ground to extract gas. In response, the governor said California has the most integrated and comprehensive oil reduction plan in America. The U.S. Climate Alliance, which involves 17 governors, announced Thursday that it would commit to several actions, including making clean energy cheaper for consumers and promoting vehicles and transit that rely on renewable energy. The summit came with 2018 on pace to be the fourth hottest year on record globally. The eight warmest years in more than a century of record keeping have all been in the past 13 years.